During Bandai Namco’s pre-Jump Festa 2016 event, PlayStation LifeStyle was fortunate to sit down with Producer Yosuke Futami and Sword Art Online: Hollow Realization Game Designer Satoshi Hirayae about all things SAO. Like all of our interviews that will be rolling out from Jump Festa, our all-too-brief discussion with Futami and Hirayae was held in conjunction with the lovely folks over at Geek Culture. During the conference, you talked about Sword Art Online: Hollow Realization boasting an original story, along with increased action elements that are stylized after the anime, can you talk about how Hollow Realization is opening itself up to newcomers? Hirayae: The Sword Art Online IP itself is based on people playing video games in the animations. 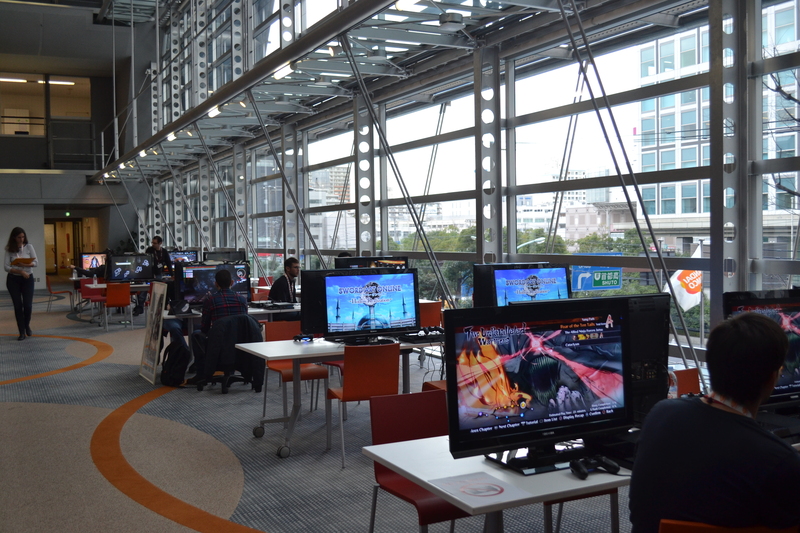 So, even if you are not familiar with Sword Art Online content but if you are a gamer, I think you will be able to connect yourself with this atmosphere. Of course, if you are a fan of SAO you will be able to enjoy it more; however, I really hope that new people will come to this game to experience the world of Sword Art Online. Futami: From the game design perspective, there is no single thing that would prevent you from going into this franchise. If you are interested in RPG games in general, or the MMO genre, you will be able to enjoy the game without any problem. The issue with the real MMO RPG is that to become a superhero in the game, it would take a lot of time and effort to be a superhero. But in this game, anyone can be a superhero, and that is a point I want to emphasis. Bringing Sword Art Online to PS4 has allowed for lush open world environments and a combat system that has “evolved,” what other design aspects have benefited from the PlayStation 4 hardware? Hirayae: The biggest difference from PlayStation 3 to PlayStation 4 would be the visuals and the number of characters being displayed during battle sequences; especially the way in which the characters will be drawn in more detail — more cool-looking and cuter. In terms of the gameplay, not just the visuals, how is this different from previous versions of the game, specifically Lost Song? Hirayae: For Lost Song, the previous installment, it was a more action-oriented game. At the same time, it lacked a better RPG element. However, in this latest installment, I’m trying to emphasis both elements: RPG and action. This is to create real Sword Art Online experiences. Futami: In terms of the Hollow series, it’s based on virtual MMO RPG, it’s not a real MMO RPG. So thanks to the genre, many of the characters in the towns are more lively and they’re acting like real characters in the world. 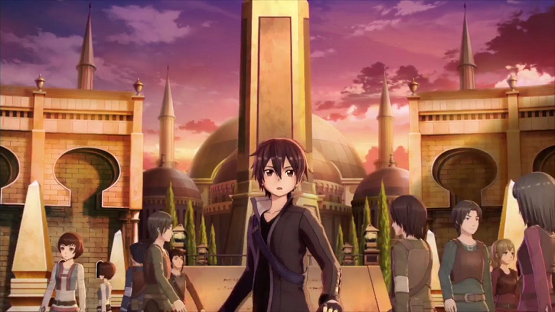 So, let’s say you’re walking through a town and someone says ‘Hey, Kirito! Let’s go [do a] quest together!’ There will be a lot more interaction with characters, even if you are just roaming around the battlefield, you will see some characters battling against other enemies. So, you’ll have the choice to fight with them or when you’re fighting some other NPCs will join in your battle. Those interactions are something that’s very unique to [Hollow Realization]. GC: Can we expect the AI for the NPCs to be more interactive? Futami: Let’s say Asuna asks you to go on a quest, and you also invited another party member, you’re in a party of three and imagine you’re in front of a really huge boss. So, Asuna suggests to you: ‘Let’s attack on his face!’ and the other party member suggested: ‘No, let’s attack on his leg!’ You’re about to make choices. Let’s say you choose Asuna’s strategy and attack the face, Asuna will be happy, but at the same time, the other party member will be a little bit upset because her opinion was not taken. There are many communications like that would impact the gameplay eventually. Does that mean there’s a friendship level that will go up and down? Futami: OK. Let’s say you met the other party member that you upset ten minutes ago, and you say, ‘what’s happened to her? Let’s go out!’ You know, you can ask for her to go out [on a date] to compensate for the choices you made. In terms of the release of Hollow Realization, is it going to be localized together with the Japan release? Hirayae: I’m making the best effort to finalise a development schedule for the worldwide versions. My current aim is to have simultaneous release with Japan version and localized version; however, it’s not so clear how close it will be, but I’m doing my best to make [the gap] as close as possible. One final question: With the release of Hollow Realization across PS4 and PS Vita, can players expect some element of Cross-Play between the two? Or Cross-Save? Futami: In regards to Cross-Save, it’s still up in the air. This is something I’m paying close attention to, say please stay tuned. Cross-Play…to be straightforward, I’m not pushing to make that happen. That’s because I wanted to make each platform have different specialities and I wanted to maximise the power of each platform. So again, I want to provide the best experience for each platform at the same time, while not planning to have the Cross-Play functionality. A special thanks to Bandai Namco and in particular Yosuke Futami and Satoshi Hirayae for answering some of our questions. Sword Art Online: Hollow Realization is expected to launch for PS4 and PS Vita come 2016 in Japan, though there’s no word yet on a western release.